Ugandan rapper Gilson Wabuyu popularly known as Gravity Omutujju who was reportedly shot by a security guard last evening is now in a stable condition after he had surgery this morning at Rubaga Hospital where he's admitted. Omutujju was shot on Wednesday evening at LK Petrol Station in Bukuya Sub County, Kassanda District, according to Wamala region police spokesperson, Mr Norbert Ochom. Mityana Municipality MP Francis Zaake who, on Thursday, visited the 25-year-old singer at the hospital said: "He has just been retrieved from a theatre and a medical report shows no major internal injuries." The MP said they got information that Omutujju had parked at the gas station waiting for his guide to a venue he was due to perform. "But the guard ordered him to leave and a brawl ensued. 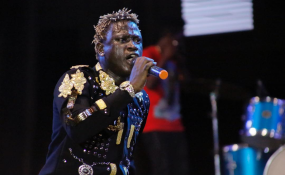 The guard then reached for his gun, shot through the windscreen and a bullet is said to have rubbed past the stomach of the artiste," the MP said. Mr Zaake said he's the one who sent an ambulance that transferred the rapper from Blue Star Clinic in Bukuya to Rubaga Hospital in Kampala. "His condition right now is not very worrying and he could be discharged by this evening," Mr Zaake said. In a statement issued on Thursday morning, Mr Ochom said three people including the guard were in custody as invetigations continue.